I think the charm and addiction of wooden pallet coffee tables is getting a bit fainted or lightened up, is it so? Well, to me this can never happen, I would always love these pallet creations with the same passion and obsession. But just for some moody and stubborn kind of guys we are introducing something different all in the shape of basic wood shipping pallets. We are bringing wood pallet PC decor tables. Exciting right? I knew it you guys would appreciate this new idea we just intended to bring about some change. 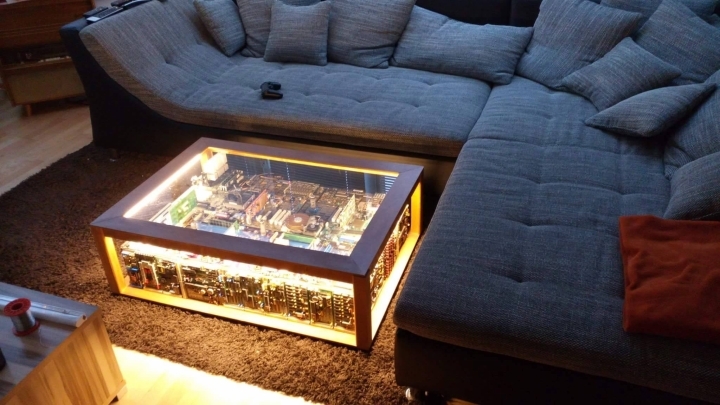 PC décor tables are getting so damn trendy now days, this is actually a whole colorful and bright depiction of a different world inside an enclosed box whether it is made with wood, or metal, or only with glass. 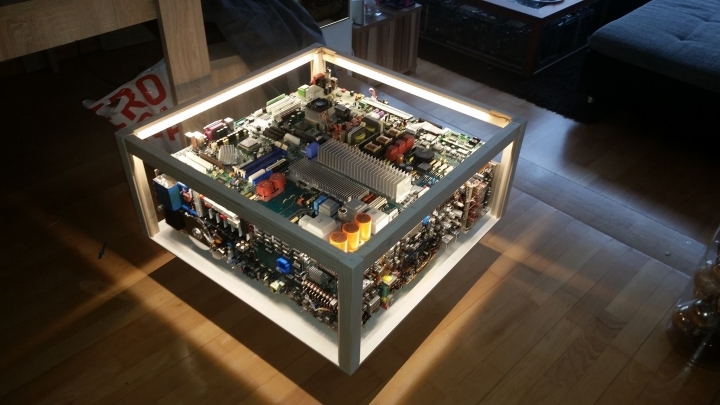 Actually the material we place inside would be the leftover, or main processor, motherboard and other parts of a personal computer. When this idea would be brought home, I mean the idea of wood pallet PC décor table, this would just a fantastic idea where you would be doing something exclusive, and you would also be recycling your scrap, your old PC you had long dumped. For the time being, here is only one inspiration that we felt to be appropriate for our special subscribers. Look at this splendid wood pallet recycled PC décor table. It feels like there is whole world squeezed inside this incredible wooden beauty, lighting work, art and beauty all at its peak undoubtedly. We have used only the sleek and thin wooden planks in this table, just to give a touch, while the rest of work is done by some high quality glass. 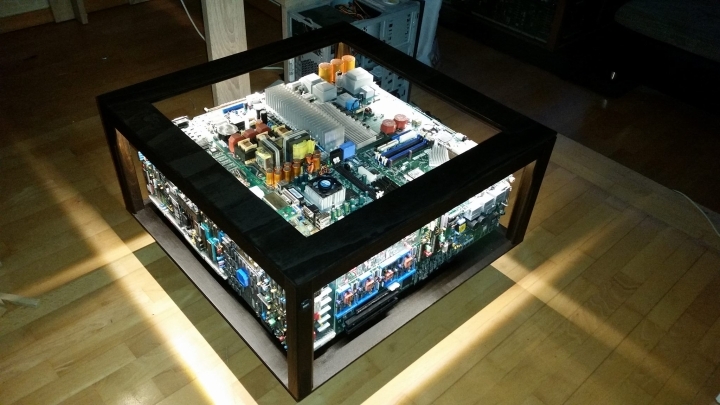 And the stuff inside the table was the trash we have had from our discarded old PC, so actually a smart plan to work on.